In the little village of Hassi Labied, our hotel invites you to enjoy the incredible landscape between the palm grove end the dunes. The changing lights and shadows give the impression to be in a living painting. The place is a real oasis of tranquillity and peace, ideal for resting or meditating. Nevertheless for those who need to remain active, a lot of activities are proposed ! The brother Ougnir will welcome you with warmness and propose you accommodation, delicious local meals and organize genuine expeditions in the desert. La source has a comfortable living room in the pure oriental style where you will savour local food (kalia, tagines, couscous) at a very affordable price. There are various pretty rooms with hot water, personal bath room and wc. All the rooms open onto a patio where you will enjoy the refreshing shadow. Our prices include bed and breakfast. Hassan and Omar propose you expeditions in the desert. - a few hours riding on a camel with a guide to attend the sunrise or the sunset in the middle of the dunes. .
- a whole night in bivouac , with dinner and breakfast. You will sleep under a real Berber Tent or if you want under the stars. .
- few days in the desert crossing the dunes, the palm groves, the nomads camps and the oasis. The price changes according to the length of the expedition. For those who are willing to discover the desert in 4x4, Hassan propose you a rally of 6-7 hours on the tracks from Merzouga to Zagora, well know to welcome the famous rally Paris Dakar. Hassan and Omar knows perfectly the region as they have born and grown up there. Durning some seasons of the year, a pond appears at the southwest of the village where will be amazed by this refreshing landscape just in the middle of the desert. The ponds attracts an incredible number of birds and pink flamingos. A real refuge of calm and freshness, the palm grove is located between the village and the dunes. A clever irrigation system bring the water directly from the center of the dunes. This green landscape makes an amazing contrast with the desert. Es war suuuper schön! Ich wollte eigentlich nur eine Nacht bleiben und bin dann vier geblieben, weil ich mich soo wohl gefühlt habe. Alle Mitarbeiter sind unglaublich nett und unkompliziert, dabei super authentisch und mega sympathisch! Auch eine vom Hostel organisierte Tour in der Wüste habe ich mitgemacht und kann ich definitiv epfehlen. Dabei bin ich anstatt mit dem Kamel zu reiten barfuss neben der Karavane hergelaufen was ich nicht nur wegen der Tiere empfehlen kann. Ein tolles Gefühl! Alles war perfekt. Definitiv der beste Aufenthalt auf unserer 2 wöchigen Marokko-Reise. Als wir um 6 Uhr morgens angekommen sind konnten wir unseren Raum schon beziehen. Wir bereuen nicht länger geblieben zu sein. Dazu gibt es einen Pool und die Wüste direkt vor der Tür. Staff, above all Hassan is amazing! Breakfast is good as well. I stayed in a dorm room and the Price Performance ratio is incredible. They also provide hairdryers. That said, I personally found that on the overnight desert Tour there was a lack of entertainment. We arrived at 5pm and were left by ourselfes Till 11pm. Then some music started but by this time some people went to bed already. So i personally wouldn't have missed sth by not doing this tour, althouhj staff is amazing! I usually don't write reviews, but this place is too good not to praise. It's very clean, the location couldn't be better (you look out the front door and see nothing but the palm grove and the dunes), very clean, very good breakfast, very nice owners. Yes, lots of 'very' here. I didn't swim in the pool but it looked very well maintained and I did enjoy the fantastic view from the rooftop terrace many times. I don't know how they do it at this price. Highly recommended. TipTop Hostel! Unaufdringliche, sehr zuvorkommende professionelle Gastgeberfamile. 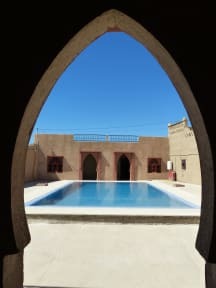 Wir als Familie haben das Hostel mit Pool am Rande der Sahara sehr genossen. Auch sehr zu empfehlen für geführte Kameltouren in die Dünen mit Übernachtung im Zelt. Die tollste Unterkunft, die ich in meinen drei Wochen Marokko hatte! Super entspannte Athmosphäre, nette GAstgeber, die sich um einen sorgen, eine wunderschöne Lage und tolle Zimmer zu einem absolut fairen Preis. We had a great time at la source! The staff is very friendly and welcomed us like old friends. You can either talk with them in English, French or Spanish what makes the communication very easy! The whole place is very clean and we had a great room and a delicious breakfast! On top of that it was great to relax at the pool or walk to the dunes what you can do in just ten minutes. We also booked a camel tour with a night in the desert in the hostel. Another unforgettable experience! Mega gute Lage mit Blick auf die Dünen. In einstündiger Wanderung kann man auf der höchsten Düne sein, die man vom Hostel erblicken kann. After finishing the amazing breakfast in sight of the first dunes you can start your discovery of Sahara desert or relax at the pool that is cleaned every day. The staff of Auberge la Source was friendly and helpful to all our needs. The price- service-balance is really great. Top!! Very nice place directly near the dunes, great breakfast and wonderful trip into the desert. Thanks!